On this day, 29 August 1917, Canada’s Governor General, his Grace the Duke of Devonshire, signed into law The Military Service Act, 1917 (MSA). Thus, all male British subjects age 20 to 45, who were "ordinarily resident in Canada," and had been "since the fourth day of August, 1914, resident in Canada," were henceforth, "liable to be called out...on active service in the Canadian Expeditionary Force [CEF] for the defence of Canada, either in or beyond Canada." For the first time in Canada’s young history, compulsory service was the law of the land. 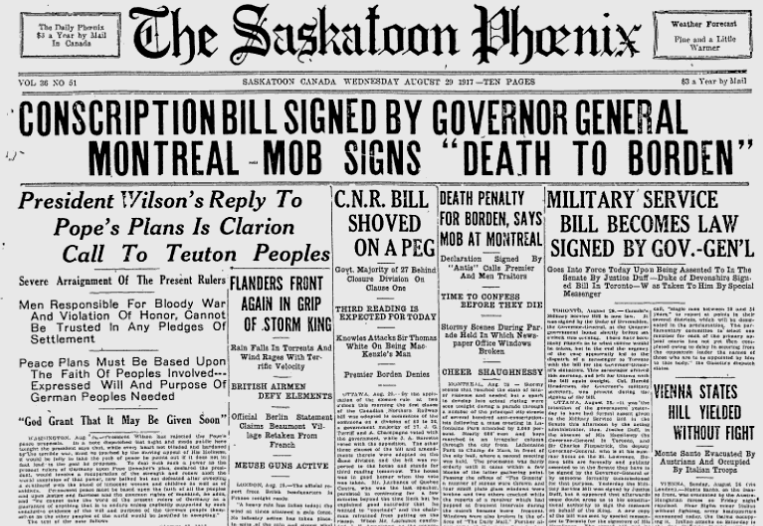 Prime Minister Sir Robert Borden had declared to his constituents in December, 1914, that "there has not been, [and] there will not be, compulsion or conscription." However, his hasty commitment just a year later to raise a force of 500,000 men had been made before the CEF had been first blooded, sustaining 6,000 casualties at Second Ypres alone. Moreover, while recruiting levels over the next year remained fairly high, after April 1916, and in the wake of ever-increasing casualties, they experienced a precipitate decline. And so, with Canada’s costly tactical victory at Vimy Ridge (10,602 total casualties, including 3,598 dead), and only 4,886 volunteers the month before, Borden faced a major dilemma. He could reduce the size of the Canadian Corps to three infantry divisions or perhaps to two, or he could implement compulsory military service. In a remarkable reversal of policy, he chose the latter, thus unleashing a divisive political storm, the likes of which Canada had never seen. Public opposition to the MSA was immediate and featured protests large and small. Indeed, such opposition manifested itself in a most dramatic and troubling fashion in Quebec, but general resistance to compulsory service eventually reared its head from coast-to-coast. Over the next eight months, Canada would be gripped by heretofore unknown levels of fear and recrimination, just as tens of thousands of conscripts made their way overseas - crucial reinforcements for the campaign of 1918.